HOW DO I KNOW IT'S A TTY CALL? "In the history of deaf people, few events have had such significance as the development of a special type of acoustic coupler by Robert Weitbrecht, a deaf scientist, in 1964. This device, used with a teletypewriter (TTY), enabled deaf people to communicate by telephone. The telephone had been a formidable--and ironic--social and cultural obstacle for the deaf since its invention by Alexander Graham Bell in 1876. Ironic, because Bell was a teacher of the deaf by vocation. His invention forever changed the way most people communicate with each other, but it thrust deaf people into a communications limbo worse than any they had known previously. Weitbrecht's device made it possible to send and receive printed messages on paper over existing phone lines simply by typing on TTYs. Thus, deaf people finally had a way of making use of Bell's creation, and this seemed no less than a miracle. The first TTYs equipped for use by deaf people had little effect on deaf life, however. The machines were extremely large and heavy and limited in supply. In 1968, the entire network of TTYs in use consisted of just 25 machines. During the next few years, this number steadily increased as Western Union, American Telephone and Telegraph, and other businesses donated second-hand teletypewriters to the deaf community for conversion to phone use. But only a handful of private firms and public agencies obtained the TTYs, and so their practical value remained largely limited to personal calls between the few deaf people who owned them. During the early 1970's, technological advancements led to the development of a new generation of phone machines for the deaf. The massive, dishwasher-sized TTYs gave way to smaller, lighter machines that produced messages on an electronic display screen. The first of these new machines were expensive and many people could not afford to buy them. In 1974, only about 7,000 TTYs were in use worldwide. And only a small percentage were found in places other than deaf homes." Bill Graham (1988). One Thing Led to the Next: The Real History of TTYs. Evanston, Illinois: Mosquito Publishing. TTY stands for teletypewriter and it is the term preferred by the Deaf Community. You may also see the terms TT (Text Telephone) or TDD (Telecommunication Device for the Deaf); they all refer to the same equipment. Many people are uncomfortable using a TTY at first. Find a buddy in the office or at a different location to practice with so you will be ready when the calls come. 1. Direct-connect TTYs come equipped with a built-in phone jack and are directly connected to the wall phone jack via a phone wire. You do not need a separate telephone to use this type of TTY. You will dial and hang up directly from the keyboard. Follow the step-by-step directions in the owner's manual. Most direct-connect TTYs only have a small flashing light built into them to signal when it is ringing. This is difficult to see unless you are looking directly at it. You may want to add an inexpensive visual and/or audible signaling device so you know when a call comes in. An old telephone can also be used for this purpose. Note: Never connect a direct-connect TTY to a digital phone line. They must have an analogue line (which is the same as a residential phone line or a fax line) or the inner workings of the TTY will gradually be destroyed and the TTY will need to be replaced. 2. Non direct-connect TTYs with acoustic couplers are used with a standard telephone. All dialing and hanging up is done from the telephone and the phone handset is placed in the couplers on the TTY during typing. The TTY's power cord is simply plugged into any electrical outlet. 1. If you have a designated TTY number, assume all calls coming in will be TTY calls and answer them on the TTY, rather than using your voice. Many hearing people do not know what the designation "TTY" or "TDD" or "TT" stands for and will try to call the TTY number on a voice phone. If you continue answering the TTY number by voice, people will continue to use the TTY number as a voice number. When a voice caller hears the TTY beeps, they will usually hang up and try another number. 2. You hear TTY "beeps". To the untrained ear these may sound like the signals from a fax machine, but there is a difference between the two. The only way you will hear these "beeps" is if the caller is tapping the space bar or keys on the TTY. 3. Many deaf people do not tap the bar or keys; therefore, you will hear NOTHING on the line. These are referred to as "Silent Calls". This is the most common type of TTY call you will receive. It is also the easiest to miss, because you assume the caller hung up. You need to ASSUME it is a TTY call and answer it with your TTY. If you don't have a designated TTY number, you may need to institute an office-wide "silent call" policy. For example, 911 dispatchers have a policy whereby calls are answered in voice by saying, "This is 911, what is your emergency?" This sentence is repeated a second time. If no response is heard, it is assumed the call is a TTY call, not a hang up, and answered with the TTY. 4. You hear a computer voice announcement that says, "TTY call, please use text telephone." The caller activates this announcement by pressing a series of keys. Deaf callers seldom use this method. DO make sure your TTY is charged or plugged in before making or answering a call. Sometimes hitting a few keys or the space bar will correct the 'garbage'; other times, not, and the message will need to be repeated. DO identify yourself at the earliest possible opportunity. A TTY user cannot identify someone's voice or gender. Something simple like, "THIS IS THE CAREERCENTER EVELYN SPEAKING GA", is perfect. DO use abbreviations if they are clear in context. There is a listing of the common TTY abbreviations on the last page of this booklet. You may use your own abbreviations as long as both parties understand what you mean. For example, if you were talking about Dr. Richardson, after typing his full name once or twice, then later referring to him as "Dr. R", is perfectly acceptable. DO use proper etiquette on the TTY. There is no way to interrupt on a TTY or know when the other person is finished, so we use "GA" to end your turn. This means, "Go Ahead" and is used like "over" in a two-way radio conversation to signify it is the other person's turn to type. Which reads, "HI, HOW ARE YOU TODAY? Once someone types in the first double "SKSK" the conversation is over. DO ask the other person to repeat if the message is garbled or you can't understand it. DO ask the other party to repeat a phone number, address, date or time to be sure it is correct. Or, type it back to them to verify accuracy. DO indicate if there are other people watching the conversation. For example. "THIS IS MARY AND ALICE IS HERE WITH ME". Not doing so is akin to putting a person on speakerphone and not telling them. Just as a hearing caller wants to know who is hearing their conversation, a deaf person wants to know who is seeing theirs. DO keep your sentences and responses short. Keep the dialogue going back and forth. During a hearing phone call, if someone is asking too many questions or talking too long, we say, "hold up a second, I'm lost," or something to that effect. Since you can't interrupt someone typing on the TTY, be sure to give the other person a chance to catch up. This is especially important during a crisis. Keep the person typing on the other end of the line and don't give a long set of instructions. A note about 'garbage' on the line: Imagine typing a long monologue only to find out it was garbled after the first word and you have to repeat it all, so keep it short and simple. Be nice, take turns! DON'T worry about misspellings if the meaning is clear in context. TTYs do have a backspace key, if necessary, to delete letters or words. Don't use this unless you have to. If you are really making a mess of things, some people will simply type "XXXX" which is like erasing the past few word(s) and start over again. DON'T worry about punctuation. When using a hearing phone, you don't say, "I went to the store today (period) I don (apostrophe) t know (comma) but (comma) I think I bought the wrong thing (period)" It's the same with the TTY; you don't need to type in the periods, commas or apostrophes. People will understand "dont" means don't and "cant" means can't. Don't waste valuable time trying to find the punctuation keys on the TTY. TTY calls take a long time. Make it easier on both of you. TTY users will often tap the space bar a few times in between sentences, to create a visual space on the readout. They may also type ........to indicate a pause, much like one pauses between sentences or thoughts when speaking. DON'T save the hard copy (paper copy) of a TTY conversation unless you ask the person for their permission. Use the same courtesy for a deaf caller as a hearing caller. You would not audiotape a voice call and play it for others to hear. Don't keep a TTY paper copy for others to read. When the TTY conversation is done, write the message or notes on a separate piece of paper, just as you would take notes or a message from a voice conversation, and throw out the TTY print out. DON'T eavesdrop or allow eavesdropping (eyedropping?) on a TTY conversation. The first language of most Deaf people is American Sign Language (ASL). There is no written form of ASL. Most Deaf people are bilingual, with English as their second language. The grammar and structure of ASL is very different from English. Don't make assumptions about a person's language capacity until you have considered your own ability to communicate in a second language. Reading typed words on a TTY does not convey emotion, as tone of voice does, nor does it indicate how a comment was intended or received. Deaf people will often add words like "SMILE", "GRIN", "LAUGHING", or "HAHA" to show emotion. Misunderstandings can occur due to the inability to hear tone of voice. Think of all the different ways you could say the word "FINE" when asked how you are doing. Depending on the inflection in your voice, it could mean anything from "doing very, very well" to "life stinks". Just keep this in mind if confusion arises. Match your language to the Deaf person's. Don't use professional jargon or idioms. KEEP IT SIMPLE. Some TTYs have a paper printout; others do not. All TTYs with printers have the ability to turn them on and off. Have extra rolls of TTY paper available and handy. TTY calls take much longer than voice calls. AT&T gives a 70% discount on long distance calls for TTY users because of this. Please be patient. Some of the newer TTYs do have an interrupt key on them. When activated, it will make the TTY on the other end flash .INTERRUPT. on the screen. This only works if both TTYs have interrupt capability and it is turned on. If you are on the receiving end of an . INTERRUPT. type in "GA" immediately. Don't wait to finish your sentence. Be sure to publish your TTY number on everything: correspondence, letterhead, business cards, pamphlets, brochures, giveaway pens and mugs, etc. You will, on occasion, get a relay call, or need to call a deaf person when you do not have access to a TTY. The relay system is available 24 hours a day, seven days a week, 365 days of the year. Basically, a deaf person dials 711 and types in the number of the person they want to call. The Call Assistant (CA) then calls that number and says, "This is Call Assistant number ___ with the Maine Relay Service. Are you familiar with the Relay Service?" If not, the CA explains how the process works. If you are familiar with the Relay Service the CA then says, "Okay, just a minute", and connects the call. You speak to the CA (using GA at the end of your turn) and the CA types to the deaf person. Speak slowly so the CA has time to type what you say. The CA will read to you what is being received on their TTY. "Maine Relay Service; to place a call, press "1". For general relay instructions, press "2". For collect calls, credit card calls, or special call requirements, press "0" (zero) for the next available CA." 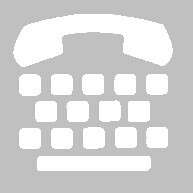 The Maine Relay Service phone number for hearing AND deaf callers is 711. Sometimes you will receive a TTY call and not be able to help the caller. If you know who can, and they don't have a TTY in their office or building, call them on your voice line, give them the Relay and TTY number of the deaf person, and have them return the call. Two other types of Relay calls you may receive are Voice Carry Over (VCO) and Hearing Carry Over (HCO). Some people who speak, but cannot hear, use VCO. You will hear the voice of the caller and the CA will type your responses so the caller can read them on their TTY or VCO phone. People who can hear, but not speak, often use HCO. The caller types their message onto the TTY, which is read to you by the CA. When you speak, the caller will hear your voice (not the CA). These types of calls can only be made with the assistance of the Relay Service. "YOU HAVE REACHED THE ANSWERING MACHINE FOR THE DEPARTMENT OF ________. OUR OFFICE HOURS ARE _____ TO _____. PLS LV A MSG AND WE WILL CALL YOU BACK ASAP DURING REGULAR BUSINESS HOURS. THANK YOU GA"
Have an office policy regarding silent calls, returning answering machine messages, (including maximum time allowable to return a call) and plans for phone and TTY coverage during lunch, breaks, vacations and sick days. Do not leave the TTY on Auto-Answer (answering machine) all the time. If you regularly answer the voice phone, you should also answer the TTY. Please leave this booklet under your TTY for easy reference or when teaching a co-worker, temp, or new hire how to answer all the phones in the office.